Welcome to another batch of Cthulhu investigators! These are heroes for Signs of Carcosa, a small expansion for Fantasy Flight Games' excellent Lovecraftian adventure game, Eldritch Horror. 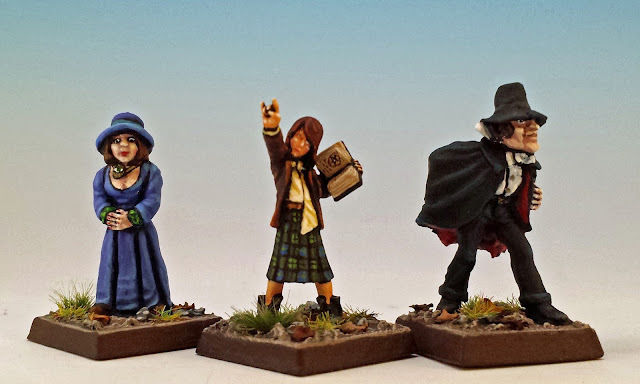 Chronic readers will recall that one of my long-term projects is to find metal miniatures for each of the investigators in this game. Carcosa is a white rabbit that runs through the past 130 years of horror fiction. This fictional city originated in Ambrose Bierce's short story "An Inhabitant of Carcosa" (1886). To my knowledge, this is the first literary work to portray a haunted and amnesiac main character who discovers to his horror that he is a ghost, and that the flitting shades around him are actually live people (for another example, see the 2001 feature film The Others). For Bierce, Carcosa was a bricks-and-mortar place, perhaps the French city Carcassonne or some Middle-Eastern town. The details are not important because Carcosa was just an incidental element with an exotic name. Robert Chambers made Carcosa immortal when he borrowed the name for his book of short stories The King in Yellow (1895). Chambers reimagined Carcosa as the dreamy setting of a play -- also called "The King in Yellow" -- which drives insane anyone who reads its script or sees it performed. Lovecraft incorporated passing references to Chamber's work in The Whisperer in Darkness (1931) and the Dream Quest of Unknown Kadath (1927), but it took August Derleth to firmly instantiate Carcosa into the Cthulhu mythos in The Return of Hastur (1958). And in 2014, the HBO series True Detective gave new notoriety to Carcosa and the King in Yellow. Carcosa and the King in Yellow have a haunting power. Isn't it scary to think that merely watching a play can drive you insane? It's not unlike the cursed video in The Ring (2002) or "the Entertainment" in Infinite Jest (1996). All of a sudden, a work of art is a lethal virus, and there's no way to protect yourself. For my part, I think the seed of Robert Chamber's perilous concept for Carcosa is the idea (prevalent in the late 19th and early 20th centuries) that works of art could wreak permanent moral or psychological harm on the public. 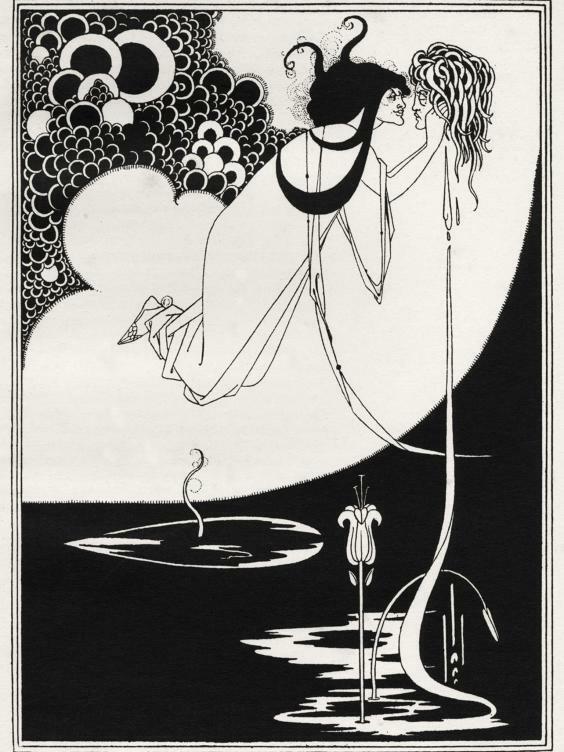 This was the age that saw puritanical condemnation of Aubrey Beardsley's periodical The Yellow Book (1894-1897), violence at the premier of Stravinsky's Rite of Spring (1913), and outrage at Oscar Wilde's play Salome (1891), which was banned from the English stage for 40 years. 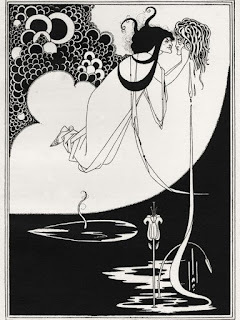 Indeed, with its dream-like poetry and decadent plates by Beardsley (see right), Salome has always seemed to me to overlap with Chamber's play The King in Yellow. It's also worth noting the importance of the colour yellow -- it's not accidental that the King in Chambers' play wears rags of that shade. Authors like Dickens or Charlotte Bronte had long used yellow to suggest decay. But in the 1890's, yellow came to stand for a particular kind of decay -- the spiritual decay of modern ideas. During the late Victorian era, French fiction (often racy French fiction) was imported into England in distinctive yellow covers. Yellow became associated with decadence and avant-garde arts -- so much so that the 1890's garnered the name "The Yellow Nineties". 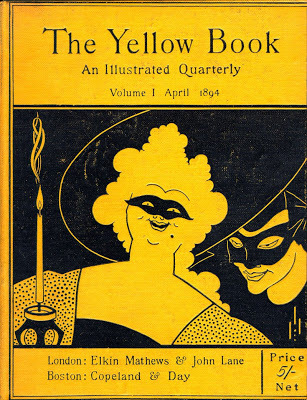 Such associations were exactly why Aubrey Beardsley named his anti-establishment magazine "The Yellow Book". Such a name perfectly captured the idea of decadence, freedom and artistic extremism. The heavy odour of incense seemed to cling about its pages and to trouble the brain. The mere cadence of the sentences, the subtle monotony of their music, so full as it was of complex refrains and movements elaborately repeated, produced in the mind of the lad, as he passed from chapter to chapter, a form of reverie, a malady of dreaming, that made him unconscious of the falling day and creeping shadows. Speaking of creeping shadows, let's get on to the miniatures for Signs of Carcosa! Above we have Dexter Drake, the magician. His miniature is "the Ripper" from Citadel's CC1 Gothic Horror range (1986). To make him slightly less homicidal, I removed the dagger concealed beneath his cape. I also inserted a rabbit under his hat. Can you see it? This is Jenny Barnes, the dilettante. 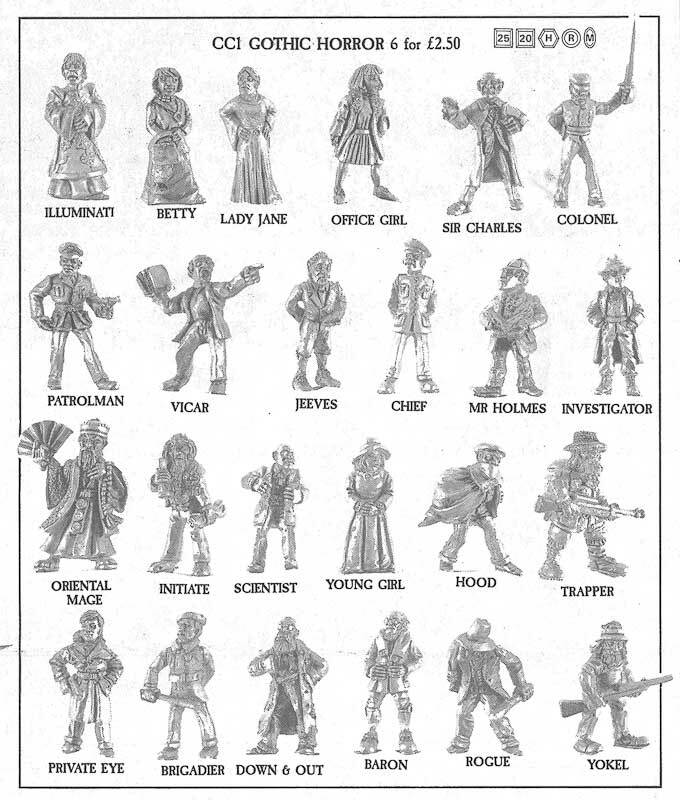 The Call of Cthulhu role-playing game (1981) introduced the "dilettante" as a class of investigator, and I'm glad that Fantasy Flight Games carries on this tradition. I have had a soft spot for this career ever since my brother introduced a new character into our long-running Call of Cthulhu campaign as "Belmont Labante-Delmonte, who's a bit of a dilettante." 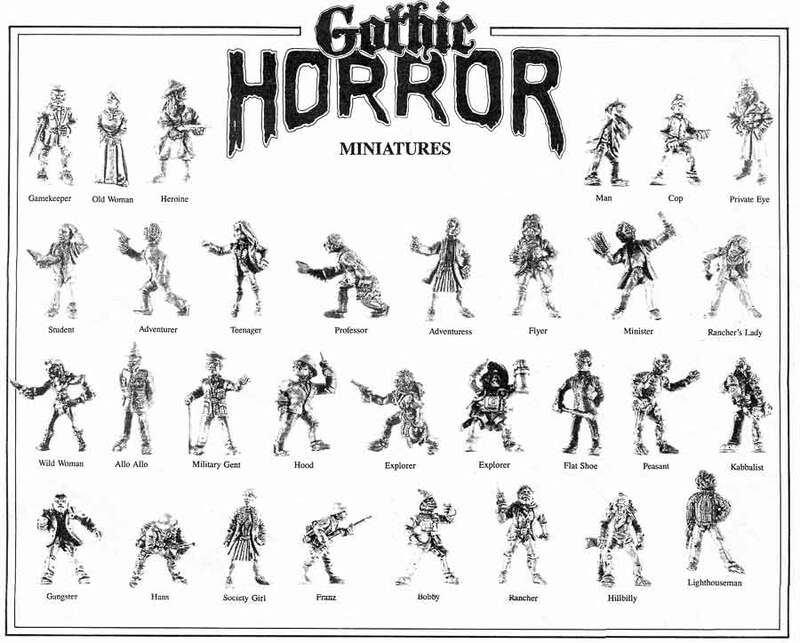 Jenny's miniature is "the Young Girl" from Citadel's CC1 Gothic Horror line (1986). I tried to leaven her air of innocence by painting a creepy eye-shaped amulet on her neck. Here's Michael McGlen, the gangster, one of the dozen or so gun-wielding Irishmen to grace Eldritch Horror. 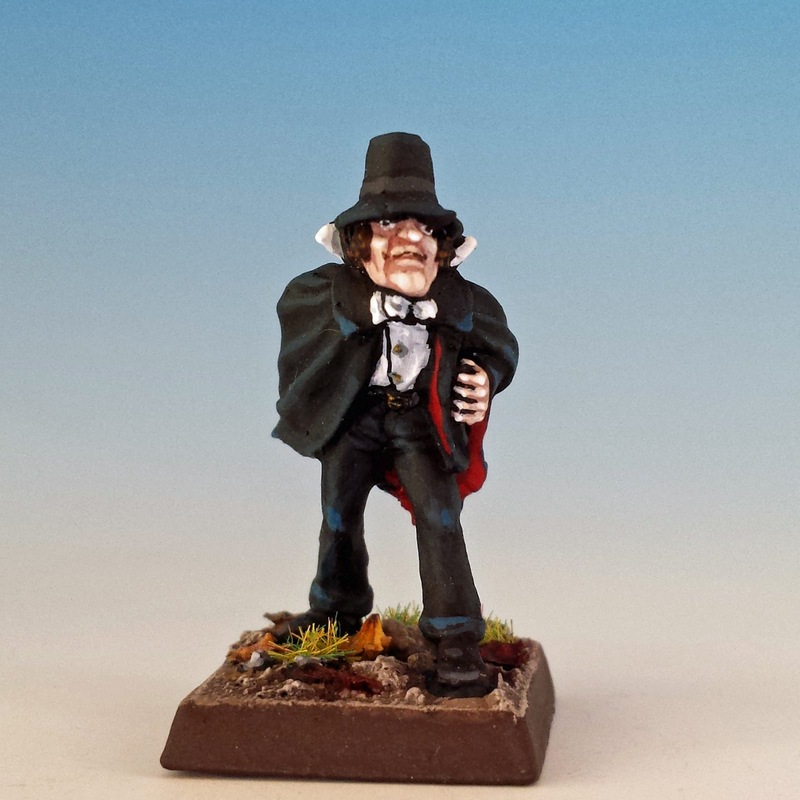 His miniature is "the Hood" from the CC1 Gothic Horror line (1986). Observant readers may note that I cannibalized the head and hand from a duplicate Hood miniature to create my likeness of Hunter S. Thompson a few weeks ago. Finally, here's Wendy Adams, the urchin. There are no children in Citadel's Gothic Horror line (and few in the entire range of Citadel miniatures), so I turned to Hasslefree Miniatures, who produce some excellent youth for the modern era. This miniature is HFA030 "Alyx", a wonderful multi-part kit that lets you customize the girl with a wand, teddy bear, pistol etc. Well, I started with Ambrose Bierce, so let's give him the final word. Here's his proto-Lovecraftian definition of 'reality' from The Devil's Dictionary (1911): "REALITY, n. The dream of a mad philosopher. That which would remain in the cupel if one should assay a phantom. The nucleus of a vacuum." GREAT piece of dark art~! Thank you Michal! I know you love this sort of thing. Really nice. And make me think though a big fan of Lovercraft's universe, I've never read Chamber's King in Yellow (by the way, you should also mention Alan Moore using the King in Yellow in the comics Neonomicon. Alan Moore is one of the big (big) gaps in my reading. You've given me another reason to get to him. Thanks Jaeckel. Thanks AM - I'm happy you enjoyed the read. I haven't heard of the Laundry series, but I will check it out. I forgot to add that you did a great job on the tartan! It's always a tricky task at this scale. Nice analysis of the "yellow" in the play's title. I was going to point out the possible additional connection to the "yellow journalism" commonly maligned in the late 19th century, but a little googling suggests the editors of Chaosium's Hastur Cycle beat me to it. a lot of Lovecraft audio for background noise while painting recently. Fungi of Yuggoth is on right now. It's been a long time since I read Chambers' book. I remember enjoying the first few stories a great deal but being quite baffled and disappointed by the way it seemed to go off the rails and turn into another book halfway through. But that was many years and a couple of wars ago. I need to pick it up again. Bet I'd see it with different eyes now. 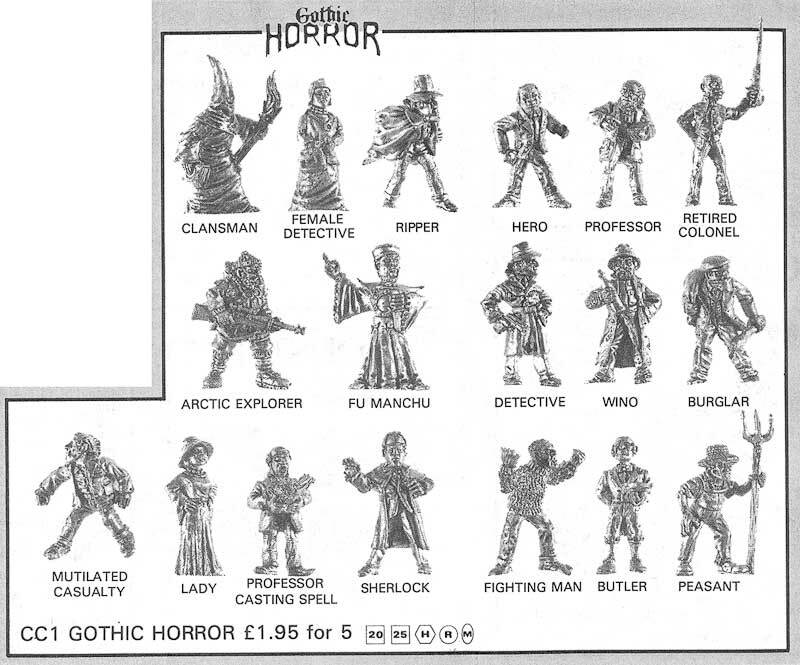 Well anyway, great minis as usual! Your output lately has been tremendous. Stellar stuff. I read Chambers' "King in Yellow" for the first time about a year ago, and I completely agree with your assessment. Promising but not quite astounding first few stories, that then petered out into a conventional and sluggish back half. I think the genius of Chambers is not really his writing as the ideas that he unleashed upon the world. Some (not me) would say that HP Lovecraft is the same way. Excellent and educational, now... have you seen the Yellow Sign? I find the process you take to design your colour schemes both illuminating and fascinating. Having come to Lovecraft very, very late in life (well, 36!) through Wayne June's audio readings I find that there is still very much to learn about his mythos. But why no pencil thin 'tash on Dexter Drake? He does have a pencil thin mustache, but it is so pencil thin that it doesn't really show up in that photo. I've added another shot of him to the post, so that his facial hair can get the attention it deserves. Dexter Drake has a look of Tom Baker about him. I most thoroughly approve. Once again, a great lineup of interesting and thoughly entertaining characters painted you your typical excellent standards. Fabulous paintjob and lovely work behind. Your is most educational blog imaginable!